The output of the k.p eigenvalues and eigenfunctions is controlled by this keyword. All eigenfunctions and eigenvalues between vb-min-ev and vb-max-ev (for conduction band: cb-min-ev and cb-max-ev) are written out in one file. !-------- range for eigenvalues and eigenfunctions ----------! Name of directory to which the files should be written. Must exist and directory name has to include the slash (\ for DOS and / for UNIX). complex-wave-functions = yes / no ! It would have been better to call this amplitudes rather than complex-wave-functions. Flag whether to print out the wave functions psi (amplitudes) including real and imaginary parts in addition to the output of the probability densities Psi². If set to yes, then kp-spinors is also set to yes. Flag whether to print out additional output for k.p. In particular more information about the eigenvalues for each k|| vector. The scale parameter can be used to scale the size of the wave functions in the output file. This is just for visualization purposes in order to fit wavefunctions more nicely into band structure plots. This scaling has no physical meaning. 1D: The units of psi² are [1/nm], the units of psi are SQRT([1/nm]). This way the integrated psi² over the whole device (which is in units of [nm]) equals 1. 2D: The units of psi² are [1/nm²], the units of psi are SQRT([1/nm²]). This way the integrated psi² over the whole device (which is in units of [nm²]) equals 1. 3D: The units of psi² are [1/nm³], the units of psi are SQRT([1/nm³]). This way the integrated psi² over the whole device (which is in units of [nm³]) equals 1. If yes, in addition to default output, the wave function psi and the probability density psi2 are shifted with respect to their eigenvalue. This is sometimes useful when plotting the wave functions together with the band edge profile. The relevant output files have the label _shift in their file names. The bulk k.p is the dispersion E(kx,ky,kz) of the material at a specific grid point (grid-position) which can be a binary or ternary semiconductor. These are the energy levels Ei of the 8-band k.p Hamiltonian H(kx,ky,kz) which has the dimension 8. In contrast to the bulk k.p dispersion which refers to a grid point, the k|| dispersion refers to the whole quantum cluster. 1D simulation: The k|| dispersion is the dispersion E(kx,ky) where z is the quantization direction, e.g. for a quantum well grown along the z direction. 2D simulation: The k|| dispersion is the dispersion E(kz) where x and y are the quantization directions, e.g. for a quantum wire oriented along the z direction. 3D simulation: A k|| dispersion does not make sense. These are the energy levels Ei of the 8-band k.p Hamiltonian H(kx,ky,kz) which has the dimension of 8 times the number of grid points in the structure. 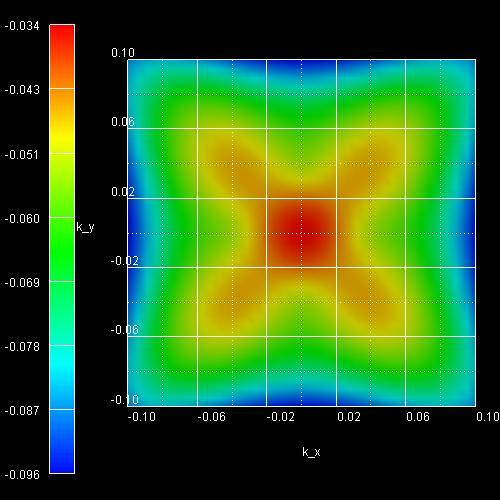 1D simulation: The k dispersion is the dispersion E(kx,ky,kSL) where z is the quantization direction and the direction where periodic boundary conditions are employed. 2D simulation: The k dispersion is the dispersion E(kSL,x,kSL,ykz) where x and y are the quantization directions and the directions where periodic boundary conditions are employed. 3D simulation: The k dispersion is the dispersion E(kSL,xL,kSL,yLkSL,z) where x and y are the quantization directions and the directions where periodic boundary conditions are employed. bulk-kp-dispersion = yes ! Calculates energy dispersion E(k) where k is real. = real-and-imaginary-k-vector ! Calculates energy dispersion E(k) where k is real and energy dispersion E(k) where k is imaginary. Flag that signals if you want to output the pure bulk k.p dispersion E(k) = E(kx,ky,kz) along a line from k = 0 to k = (kx,ky,kz). This is especially of interest in strained regions where the bands are shifted due to strain. The dispersion is taken at the material grid point grid-position which has to be located inside a quantum region. The parabolic, isotropic dispersion of the effective-mass approximation (single-band) is included for comparison. Flag that signals if you want to put out the pure bulk k.p dispersion E(k) = E(kx,ky,kz) over the three-dimensional k space. This can be of interest in strained regions where the bands are shifted due to strain. The dispersion is taken at the material grid point grid-position which has to be located inside a quantum region. The maximum value kmax is determined by MAX(|k-direction-from-k-point|,|k-direction-to-k-point|). k space grid resolution: The number of k points from the Gamma point along each direction is number-of-k-points/4. which is correct ONLY for the unstrained case. In the strained case the character is no longer "purely" heavy, light and split-off hole-like if strain is present because all the states are mixed! Note that the '1' and '2' states might be degenerate. To see an example, please refer to the Tutorial "Strained Silicon". Determines position of point in structure for bulk dispersion (must be within a k.p quantum cluster). The bulk k.p dispersion can be calculated along an arbitrary line from the k point 'k-direction-from-k-point' to the Gamma point and then to the k point 'k-direction-to-k-point'. Either k-direction-from-k-point or k-direction-to-k-point or both can be zero. If both are zero, then only the Gamma point is calculated. If k-direction-from-k-point is omitted, then this specifier takes the negative value of k-direction-to-k-point. You can use this flag to specify a customized plot for the E(k) dispersion, e.g. along a line from  to the Gamma point and then to the  point. Determines k-direction and range for dispersion plot [1/nm] to the Gamma point. Determines k-direction and range for dispersion plot [1/nm] from the Gamma point. number-of-k-points = 50 ! If omitted, the default value of 50 is used. Number of k points to be calculated (resolution) in addition to the Gamma point at (kx,kykz) = (0,0,0) for the bulk k.p dispersion along a particular direction. E(k=0) = 0 eV for the heavy and light holes dispersion (unstrained case) or to the topmost hole energy (strained case or wurtzite). The conduction band dispersion then starts at the band gap energy and the split-off energy dispersion at delta_split-off. These directions might not be general enough for wurtzite or strained structures but one can rotate the crystal coordinate system with respect to the simulations coordinate system accordingly in the input file. Inside the code, the k.p Hamiltonian is calculated with respect to the "calculation coordinate system" while it holds for all the output files that the [kx,ky,kz] directions are related to the "simulation coordinate system". So the software takes care of the rotations automatically. Care has to be taken when analyzing the eigenvectors as the quantization axis of spin is also relevant. Flag that signals if you want to have the E(k||) = E(kx,ky) dispersion to be put out. This is for the quantum mechanically calculated eigenvalues. This also works for 2D (but then only no and yes make sense), i.e. E(kz) but does not make sense for 3D. '01-00', '01-00-11' and '01-00-10' are special options for slices along special directions through the two-dimensional E(k||) = E(kx,ky) dispersion. - 01-00: A plot of E(kx,ky) along the line from E(0,ky,max) to E(0,0) . Note: If you use k-par-dispersion = 01-00, 01-00-11 or 01-00-10, then the calculation is much faster because only at the k|| points at these symmetry lines the eigenvalues are calculated. Obviously in this case you cannot do a self-consistent calculation. Also plotting the 2D dispersion of E(kx,ky) (i.e. the 2D plot) or the density of states is not correct in this case. Specify the eigenvalue numbers (i.e. subband numbers) for which the energy dispersion should be written out. The following two specifiers do not distinguish between electrons and holes. Lower (min) and upper (max) boundary for range of eigenvalues (ev) for which the k|| dispersion E(kx,ky) should be written out. This also works for 2D, i.e. E(kz) but does not make sense for 3D. This specifier affects the energy dispersion plots E(k||), the k||-space-resolved density plots n(kx,ky) and the effective masses calculated from the dispersion. This specifier can be used to output only the dispersion of the 1st or 2nd subband and not the dispersion all of calculated subbands. DOS-points = 1000 ! number of points between DOS-Emin and DOS-Emax (default: 1000).
! This number determines the grid resolution of the energy grid used for the density of states (DOS) output. For more information on the output (e.g. units), see below. Lower boundary for range of conduction band eigenvalues for which those and the eigenfunctions are put out. Upper boundary for range of conduction band eigenvalues for which those and the eigenfunctions are put out. Lower boundary for range of conduction band k|| points in 1D for which eigenvalues and eigenfunctions are put out. Lower boundary for range of conduction band kz points in 2D for which eigenvalues and eigenfunctions are put out. Upper boundary for range of conduction band k|| points for which eigenvalues and eigenfunctions are put out. Upper boundary for range of conduction band kz points in 2D for which eigenvalues and eigenfunctions are put out. Only for superlattices (should be greater than or equal to 1). Lower bound for range of superlattice vectors Kz (1D), Kx,Ky (2D), Kx,Ky,Kz (3D). Upper bound for range of superlattice vectors Kz (1D), Kx,Ky (2D), Kx,Ky,Kz (3D). Lower boundary for range of valence band eigenvalues for which those and the eigenfunctions are put out. Upper boundary for range of valence band eigenvalues for which those and the eigenfunctions are put out. Lower boundary for range of valence band k|| points in 1D for which eigenvalues and eigenfunctions are put out. Lower boundary for range of valence band kz points in 2D for which eigenvalues and eigenfunctions are put out. Upper boundary for range of valence band k|| points in 1D for which eigenvalues and eigenfunctions are put out. Upper boundary for range of valence band kz points in 2D for which eigenvalues and eigenfunctions are put out. which are the spatial overlap matrix elements between all calculated states in bands 'cband' and 'vband' from eigenvalues 'min-ev' to 'max-ev'. To plot matrix elements vs. electric field. with v_bias = sweep_index * sweep_voltage. The E_field is scaled to [kV/cm]. The 'voltage-offset' is the built-in potential in [V]. distance: The length of the region with constant field [in scaled units: nm] is specified via 'lever-arm-length'. This only works for intrinsic regions with quasi constant electric field, but imitates the way experimental physicists approximate the electric field. In order to use only bound states the MODULE bound_states_1D must be initialized. Calculates intersubband dipole moment and oscillator strength where the subscript i means initial and f means final state. Note that the two-fold spin-degeneracy in the single-band approximation ('effective-mass') is counted explicitely in k.p. between all calculated states in each band from eigenvalues 'min-ev' to 'max-ev'. This feature is useful for e.g. quantum cascade lasers. Note: intraband-matrix-elements must not be set to no in order to print out the lifetimes (scattering rates). See tutorial "Scattering times for electrons in unbiased and biased single and multiple quantum wells" for more details. contains all electron eigenvalues for k = 0 and quantum cluster 1 for k|| vector 5. Similar for holes and 6-band k.p. The file with the suffix _info contains information about the character of the eigenvalues, i.e. their S-like, heavy-hole, light-hole and split-off hole character. kp_8x8psi_squared_qc001_el_kpar0005_1D_dir_shift.dat - Note that in this file psi2 is shifted by the corresponding eigenvalues so that the square of the wave functions can be plotted into the conduction/valence band edge diagram. contains the square of all electron wave functions (psi2) (for each grid point) for k = 0 and quantum cluster 1 for k|| vector 5. This file contains all eigenvalues. 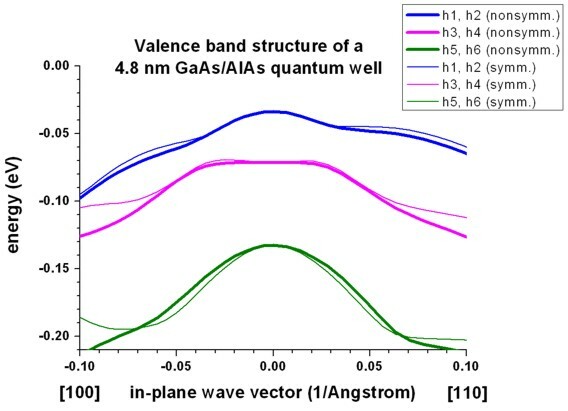 It can be plotted into a conduction or valence band profile diagram. Note that this file is written out only if detailed-output = yes. Position Sum of components^2 Squares of components of k.p-vector. Eight in case of 8-band k.p / six for 6-band k.p. + and - correspond to the spin projection along the z axis of the crystal system ( + = up, - = down). Note that the states | lh1 >, | lh2 >, | so1 >, | so2 > are a mixture of spin up and spin down. | x >, | y >, | z > correspond to x, y, z of the calculation system. Note: In nextnano3 k.p subroutine we introduced an unnecessary rotation. When we get rid of it in the future, we will have | x >, | y >, | z > in crystal system. kx, ky are in calculation system. For more details, see eq. (3.85) in the PhD thesis of S. Birner. Example: See Tutorial "Energy dispersion of holes in quantum wells". 1D: This file contains data of a cut along the line from zero (i.e. [kx,ky] = [0,0] = ) to  (i.e. [kx,ky] = [kx,0] where kx > 0) of the 2D plot of the E(k||)=E(kx,ky) dispersion. The file kpar1D_disp_00_10hl_8x8kp_ev_min001kp_ev_max010.dat contains essentially the same data but here all subband dispersions from eigenvalue min001 to eigenvalue max011 are contained in one single file. 1D: This file contains data of cuts along the line from  to zero and from zero to  of the 2D plot of the E(k||)=E(kx,ky) dispersion. To plot the data file, only the first (abscissa) and the second column (eigenvalue) are important. The file kpar1D_disp_01_00_11hl_8x8kp_ev_min001kp_ev_max010.dat contains essentially the same data but here all subband dispersions from eigenvalue min001 to eigenvalue max011 are contained in one single file. This file cannot be plotted. It just contains for each k|| point the corresponding kx and ky values as well as its corresponding eigenvalue. The two-dimensional density of states (DOS) is written to the files 'DOS_hl_6x6kp.dat' and 'DOS_hl_6x6kp_sum.dat' (and similar for electrons). The DOS has been calculated from the energy dispersion E(k) = E(kx,ky). This file contains the density of states (DOS) for each eigenvalue (i.e. subband). The first column contains the energy in units of [eV], the other columns the DOS of each individual subband in units of [eV-1 m-2]. This file contains the density of states (DOS) , summed over each eigenvalue (i.e. subband). The first column contains the energy in units of [eV], the second column the DOS (sum over all subbands) in units of [eV-1 m-2]. The files Density_at_energy_el.dat and Density_at_energy_hl.dat contain the energy resolved density n(E). n(E) = DOS(E) * f(E) where f(E) is the Fermi function and DOS(E) is the density of states at energy E.
The units are dimensionless, i.e. if one integrates over kx and ky (which are in units of [1/m]), one gets a sheet charge density in units of [m-2]. For the option to calculate and output the optical matrix elements we need the following specifiers. Note: For 'el-hl' initial means 'el', final means 'hl'. For 'hl-el' initial means 'hl', final means 'el'. This generates a 2D plot (in the AVS/Express format) for the intensity I(kx, ky) in units of [eV]. In addition, a 2D plot for the optical matrix element: P(kx, ky) in units of SQRT([2eV/m0]) is generated if optical-matrix-element-output = complex. Note that the intensity and the matrix element are three-dimensional vectors with components Ix, Iy, Iz or Px, Py, Pz, respectively, and kx, ky is in units of [1/Angstrom]. The optical matrix element will be calculated between band-min and band-max eigenvalues. The k|| points are the same that are chosen for the energy dispersion output. a) Intensity: I = 2/m0 * |< e.P >|2: Ix, Iy, Iz, Ixy, Ixz, Iyz in units of [eV] where Ii = 2/m0 |Pi|2, Iij = 2/m0 |Pij|2 (i=x,y,z; j=1,2,3). b) complex value of the momentum matrix element Px, Py, Pz, Pxy, Pxz, Pyz in units of SQRT([2eV/m0]). Example: Optical oscillator strength of the fundamental transition in a 2D quantum wire calculated by 8-band k.p theory. The optical matrix elements (complex) were calculated. In the picture one can see the dependence on the polarization. Note that the oscillator strength is a dimensionless quantity. It is useful in order to compare the probabilities of different dipole transitions. Most attention is paid to the matrix element. It is not taken from the database (or input file), instead it is calculated from the k.p Hamiltonian. Due to this approach all kinds of dipole transitions are calculated in the same manner. All the symmetry is taken into account automatically. The k.p material parameters can be found in the folder material_parameters/. The warping (anisotropy) is caused by C. If C is zero, than the energy dispersion is isotropic (spherical). The dispersion is nonparabolic if both B and C are nonzero. The split-off mass is currently 1/gamma1 for 6-band k.p, but for 8-band k.p according to I. Vurgaftman et al., JAP 89, 5815, eq. (2.18). The A, B, C parameters and the masses are currently not used inside the code. These values are just calculated and printed out to make the k.p parameters "more transparent".